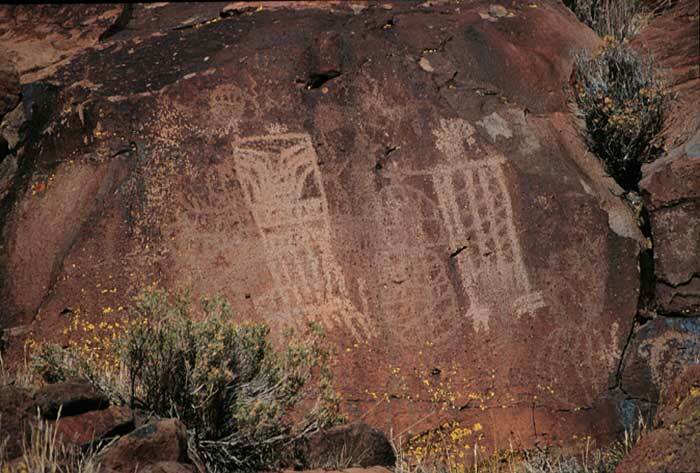 Safely within the boundaries of a thousand-square-mile military test range in the Northern Mojave, lies one of the nation's finest displays of aboriginal art, the petroglyphs of the Coso Range. Here, under the watchful eye of the U.S. Navy, volunteer guides of the Maturango Museum in Ridgecrest lead tour groups through a natural gallery of ancient rock drawings. 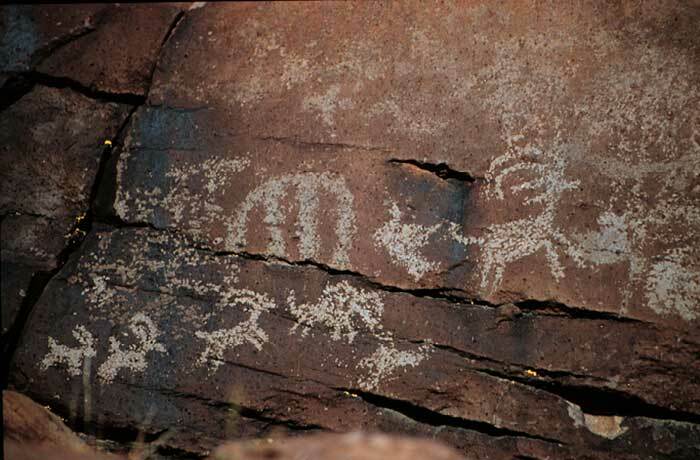 While such art, chiseled into stony outcrops and sandstone walls of six continents marks the transient existence of our ancient ancestors, the Coso petroglyphs record a culture that persisted for at least ten millennia. The regular weekend tours conducted by the Maturango Museum in spring and fall offer a view of hundreds of unique examples of the graphic tradition of the long-vanished forbears of today's Native Americans. To set the scene, imagine the high desert bare of any trace of modern human presence. Enter a small band of men carrying spear-throwers - atlatls - and women burdened with provisions in willow baskets or babies swaddled in rabbit fur blankets. These are the Old People, perhaps recent arrivals from Asia by way of the Bering land bridge. They live simply, sustained by the seeds, fruit and roots of native plants, with ample protein provided by small game, lizards, insects, and perhaps even fish from the lake that glittered in the valley below. Their language deals with the simple necessities of life, with hunting and food-gathering, and with magic and mythology that explain the inexplicable. These ideas found vivid expression when the artist, perhaps a tribal shaman or medicine-man, brought them to life as bright images on weathered stone. 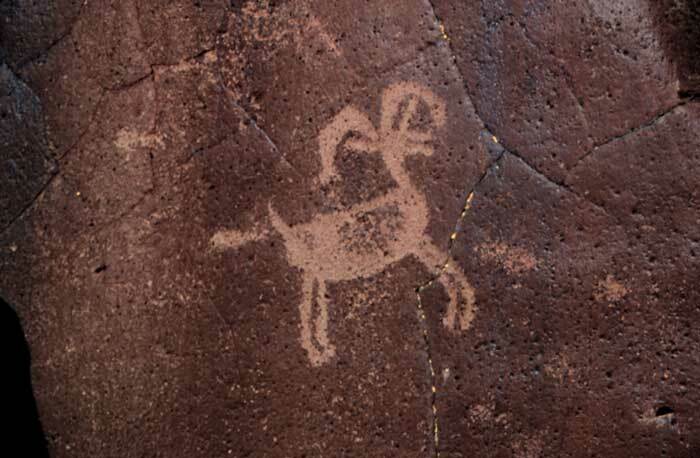 The bighorn sheep was the commonest symbol, perhaps a petition to the deities of the hunt. But the artist had other roles than petitioner; our visit will reveal a few. The tour takes visitors down a mile-and-a-half stretch of Little Petroglyph Canyon, (Renegade Canyon on topographic maps). The site lies in a volcanic mesa covered with the sparse vegetation of the Great Basin - sagebrush, rabbitbrush and Mormon tea. 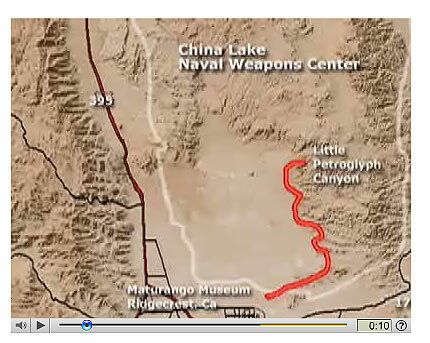 We start at the upper end of the canyon, where the oldest glyphs are found. Geologically, Petroglyph Canyon is a shallow cleft eroded through solid basalt and polished by occasional flash floods pouring out of the Coso Range. 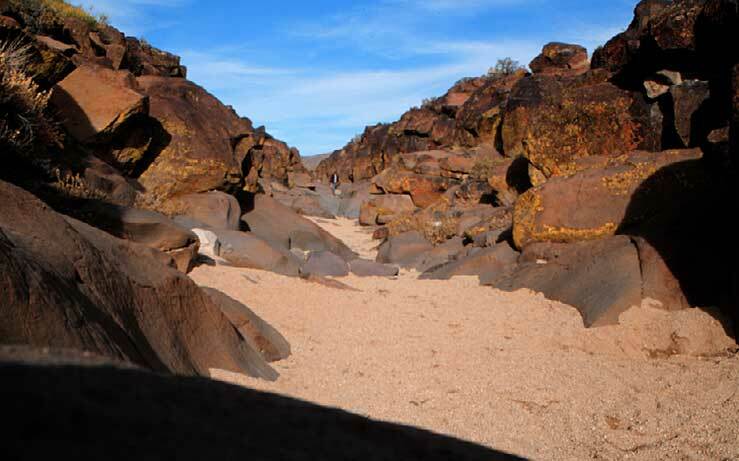 Evidence of human habitation includes foot-deep morteros and grinding "slicks" where early cooks used fist-sized manos to pulverize grains and nuts, staple items in the life of aboriginal hunter-gatherer. One such kitchen site overlooks the upper reaches of the canyon, where we can easily imagine a group of women preparing the day's meal. While their children frolic in the sandy wash below, a lone artist, with a pointed stone, patiently engraves his own contribution to the growing accumulation of cryptic images on the rock wall. The upper end of the canyon, perhaps twenty feet deep and four times as wide, contains some of the oldest petroglyphs. Their age can be roughly gauged by the restoration of the deep brown patina, or rock varnish, that slowly forms on a freshly exposed basalt surface. Scientists have found that the varnish is actually a tissue-thin layer of manganese-stained clay particles and microbial material. By measuring the subtle change of chemical composition that occur in this layer over the centuries, one group of archeologists estimated the age of the oldest images at 16,000 years. Other workers dispute the early date, suggesting that the oldest Great Basin artifacts are closer to 10,000 years old. Several distinct motifs are found in the upper canyon. The simplest are the random, meandering patterns that defy subjective interpretation. Their meaning, if there was one, has been lost with the artists who made them. At the next step in graphic sophistication, geometric patterns appear: These include concentric circles, sunbursts, patterned rectangles, and a peculiar symbol that looks like jailhouse bars. After puzzling over this enigmatic symbol for years, I heard one visitor suggest that it looked like a weaver's loom. Given that weaving is one of man's earliest crafts, the idea sounds reasonable. Checkerboard patterns found here and farther down-canyon, could easily represent a weaver's artistic efforts. Here, too, are early forms of representational art -- recognizable pictures. One, a five-foot-long bighorn sheep appears near the canyon bottom, unaffected by thousands of floods. It is a childishly simple figure, but its thickened outline is deeply worn, as if by repeated efforts to strengthen its magical purpose of ensuring success in another hunting season. On a nearby boulder is a remarkably animated two-foot-long deer, its legs stretched in full stride and its antlered head turned toward the viewer. What makes this image unique is its finely drawn lines, as if it had been engraved with a steel scriber, rather than a chip of rock that would be quickly dulled. Another mystery is found on a rock ledge close by; some have labeled it "Halley's Comet." A palm-sized six-pointed star can be seen in the glancing light from the morning sun, and trailing behind it is a zig-zag tail. It brings to mind the depiction of a comet, later identified as Halley's, on the Bayeux Tapestry, which recorded the Battle of Hastings in 1066. Needless to say, any other brilliant comet, or any other appearance of Halley's, would fill the bill. Continuing down the sandy wash, we pass a short branch in which another Coso motif, the medicine bag, appears. Several are seen in a group, each a trapezoidal figure, fringed at the bottom and suspended from a horizontal staff. More recent Indian medicine men carried charms, fetishes and sacred talismans in similar deerskin bags that must have been a potent symbol of tribal authority. Another hundred yards brings us to the most impressive work of the region, a group of figures facing the sunrise on a wall near the canyon rim. Were they intended to portray spirit-people or costumed men? The question underscore the interpretive chasm that surrounds the prehistoric symbols and the people who created them. The central figure carries in its right hand an upraised shaft, probably a spear-throwing atlatl, and in the other a bundle of slender objects that might be darts or arrows. Other figures are similarly equipped, and always right-handed. The tour leads for almost another mile, ending at an impassable drop-off that affords a view of Indian Wells Valley in the distance. Along the way the canyon walls reveal centuries of aboriginal imagery. Sheep predominate, but there are also cat-like figures, perhaps mountain lions, and a few more deer. But much of the art is abstract, and one viewer's guess at its meaning is as good as another's.